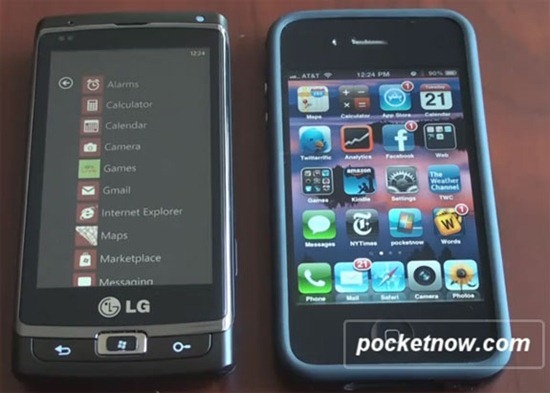 Brandon Miniman of Pocket Now has posted a very interesting video in which he compares the operating / homescreening system of Windows Phone 7 against iPhone 4 running iOS 4.x. Both have certain similarities along with places where WP7 and iOS completely take separate paths. The differences start straight from the unlock screen. iOS has a very straight-forward lock screen which doesn’t give much information over the standard time and date whereas WP7’s, while being minimalistic, is anything but simple. You can see notifications (along with time/date) right from the lock screen so there is no need to unlock the device to check for updates. Moving forward, iOS has a very app-centric homescreen system whereas WP7 offers a homescreen that has widgets or, as MS refers to them, live tiles. Users can pin custom tiles to the homescreen that offer little bits of information. Multi-tasking is definitely better on iOS because of the fast app switching system. Because of this, switching between one app and then another definitely requires more steps on WP7 which isn’t very intuitive at all. The folks at Redmond really need to tackle this issue in a big update. Fast app switching is an absolute must today.